There are many factors that contribute to Chennai’s greatness and the prime one is the culture, the tradtion and the spiritual values it upholds. Almost every day, one finds some cultural activity like dance, drama or music taking place somewhere in the city. It is the city, where Lord Kapaleeswarar flanked by Karpagambal resides. There are many other temples like Kandakottam Muthukumara Swamy temple, Vadapalani Murugan temple, Parthasarathy temple, Ashtalakshmy temple etc. which create an air of divinity around Chennai. The ancient Kapaleeswarar temple was visited by many great sages like Thiru Jnana Sambhandar and Sri Arunagirinatha Swamigal. It was here at Kanda Kottam, saint Ramalingar got the vision of Muruga. It was the grace of Muthukumara Swamy that made Vallalar a saint of universal vision and a poet of eminence. In ‘Deiva Mani Malai’ which he composeeryd at the age nine, he described Chennai as ‘Dharmamigu Chennai’; the Chennai which upholds the principles of Dharma. Pamban Swamigal said Muruga came in his dream and asked him to proceed to Chennai. On arrival, an unown cartman received him, transported him to a devotee’s house, at 41, Vaidyanath Mudali Street at St. George Town and disappeared. This is the sacred city where Sri Sankaracharyas of Kanchi Kamakoti Mutt and Sringeri Mutt used to frequent and guide the devotees. Though Thiruppugazh tree taken its roots at Tiruvannamalai, its branches spread all over the world and Chennai has the privilege of being known as the centre-stage of Thiruppugazh movement. The house of Sri Chengalvaraya Pillai at 292, Lingi Chetti Street, Madras used to be so vibrant with activities connected with Thiruppugazh that it came to be known as the ‘Ancestral Home of Thiruppugazh’ or Thiruppugazh Mother’s house (Thai Veedu of Thiruppugazh). It is Chennai, Sri Sachidananda Swamigal used as a platform to initiate many programs like Thiruppugazh Recital, Tiruthani Padi Vizha etc. Inspired by the glory of Thiruppugazh, it was Sri Muthuswamy Iyer who established Adiyar Thirukoota Iraippani Manram at Chennai around 1950. This establishment conducted Thiruppugazh Bhajan regularly at Anubhuti Mandapam at Chennamalleeswarar temple in Chennai. It is here, the legend, the Judge of the Madras High Court, Sri T.M. Krishnaswamy Iyer, one of the founders of P.S. Higher Secondary School, Mylapore, popularly known as Thiruppugazh Mani Iyer used to lead ‘Thiruppugazh, Isai Vazhipadu’, the Satsang which this writer had the privilege of attending. Sri Muthuswamy Iyer established ‘the United Concern’ which produced and sold quality tooth powder known as ‘Nanjagudu Palpodi’. But that was only secondary concern or profession. He considered his main profession to sing Thiruppugazh (Padum paniye paniyai arulvai). The ‘United Concern’ provided platform for Satsang for all Thiruppugazh Anbargal. With a view to highlight Thiruppugazh, which is hailed by devotees as a wonder (Bhaktargal Arbudhamena Othum), Sri Muthuswamy Iyer brought out “Thiruppugazh Malai” containing nearly 400 songs, including Anubhuti, Alamgaram, Virutham and Vakuppu. It was the first time Thiruppugazh songs were brought out in an easily accessible book form. He also brought out a monthly magazine in the name of ‘Amrita Vasani’ in which many unique articles on Thiruppugazh appeared. The magazine became a house-hold name in those days. When the eighth edition of ‘Thiruppugazh Malai’ was under print, ‘Thiruppugazh Muthu’ attained the Lotus Feet of Muruga. Devotees of Thiruppugazh continued his work and continued to bring out new editions and the 10th edition of ‘Thiruppugazh Malai’ came in 1990. This small handy book which came in a yellow wrapper became the most sought after book of that period. Though many books on Thiruppugazh songs came, like ‘Thiruppugazh Madani’, works by Thiru Muruga Krupananda Variyar and ‘Thiruppugazh Isai Vazhipadu’ by Thiruppuygazh Anbargl, the small ‘Thiruppugazh Malai’ continues to retain its charm for its colour, for its contents, for its size and for its age. It is learnt that Giri Trading has taken its copy right and continues to publish it. Thiru Muruga Krupananda Variyar who took the glory of Thiruppugazh to Himalayan height by way of his discourses and books used Chennai as the base for his Thiruppugazh mission. Another resident of Chennai was Sri Murugadas, who owned a golden voice, a heart full of devotion and a mind that always thought of Muruga. Having passed through many glorious eras and having witnessed the rise of many saints, the ‘Thai Veed of Thiruppugazh’, Chennai, became the venue for another grand event. When the sun dawned on 22nd April 2017, Muruga devotees forgot all about the material world and assembled at SVR Mandap at Royapettai to witness the grand spectacle of Guru Samarpana Thiruppugazh Isai Vizha. Perhaps, never before, so many Thiruppugazh Anbars, drawn from all parts of the world, congregated at one place to immerse themselves in the shower of Thiruppugazh Amrutam (the nectar of Thiruppugazh); the shower which continued for the next day. The visit made by Sri Sankaracharya of Kanchi Kamakoti Peetham and the blessing he accorded turned out to be the crowning glory for the event. 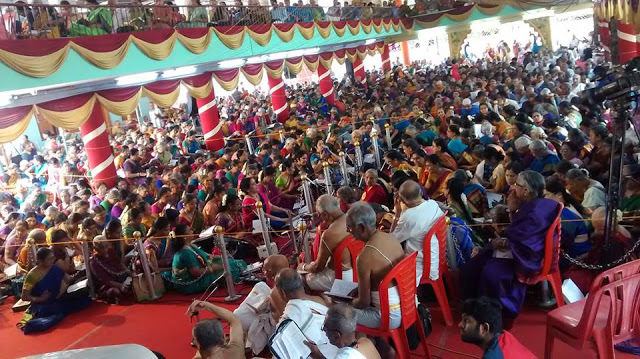 The huge audience, devotion and dedication writ large all over their face, could be compared only with a similar grand event, Mahamaham, that is held at the sacred abode of Lord Siva, Kumbakonam. For a moment, I kept wondering what a powerful movement a single individual, Guruji Sri Raghavan had created.